This time of year, my head always turns to gardening, as I start to dream of warmer days and fresh produce! And one of my resolutions every new year is to have a bigger garden than the year before. This means I spend a lot of time perusing garden catalogs and books, and I want to share a new favorite with you.
. That caught my attention long enough for me to read the table of contents, and then I was hooked! I wanted to read it, so I asked the publisher to send me a copy in exchange for an honest review. 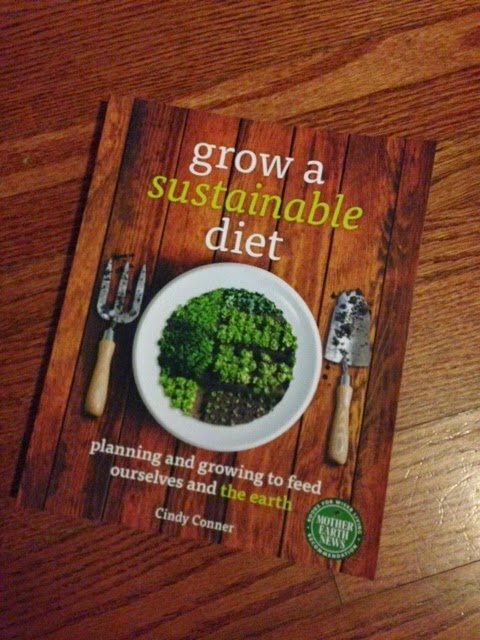 Cindy tells you everything you need to know to grow as much of your own food as your heart desires. By the time you are done reading this book, you will know how much food you need to survive for a year, and how much space you would need to grow it and then to store it. You will also learn how to naturally fertilize the plants during the growing season. The book is filled with drawings, garden maps, and worksheets so that you can easily apply the wisdom that is shared in the text. You’ll learn how to grow not just plants but calories, protein, calcium, and other nutrients. There is even information on where you can get your B12 through food, which is one of the trickier nutrients to consume. You’ll also learn how to provide your own oils and sweeteners, as well as small grains, such as wheat and rye. 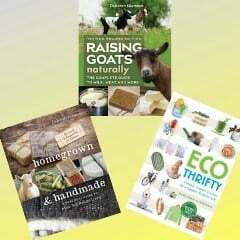 There is even a chapter on including livestock for dairy products, eggs, and meat. Cindy truly leaves no stone unturned when educating the reader about how to grow everything needed for a healthy diet. The book is rounded out with chapters on “Sheds, Fences, and Other Stuff” and one on food preservation, including root cellars, a cooling cabinet, fermentation, canning, solar food dryers, and grain mills. Although the book does not have specific plans for buildings such as chicken coops, it does have general advice that will help you with whatever buildings you choose to construct on your property. Since we didn't move to our farm until the last of May I want to actually put some thought into what we grow. My boys really want corn and I really want a winter garden. Other than that it will be a lot of what can be canned. This book sounds amazing. 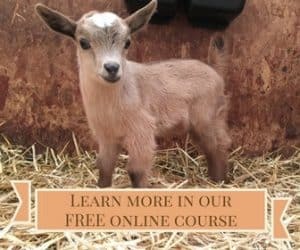 My husband and I are moving cross country to start our homesteading dreams in may. We are very excited. This book will help us plan to grow exactly what we need. Thank you for the opportunity. This book sounds awesome! We are hoping to ramp up our production this year and this book sounds like just what we'd need for help! The books sounds interesting. I especially would like to review the garden plans, small grains and sweetners. Our ground is very poor and we are a tropical climate so I plan on growing pineapples. I like the idea of the worksheets to help you figure out how much food to grow. I am also interested in the B12 information. This looks like a great book and a good addition to the library of anyone caring about their food. Sounds like a great book. I'm slowly turning my yard into a forest garden. We are currently going over our spread sheets from last year tracking calories per day of growing time per sq ft. This book would be awesome. It would be great to combine this with forest gardens and maybe raised beds for the annuals! It's great that she breaks it down for what you would actually need for a year supply of food.